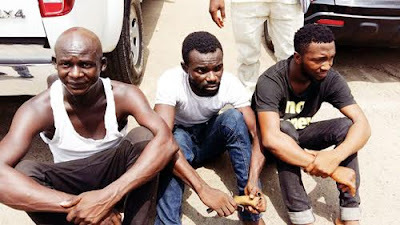 The Lagos State Police Command on Friday, February 19 paraded three members of the gang that allegedly robbed the Festac branch of popular online retailer, Jumia on October 29, 2015. The gang looted N1.2 million in cash, phones, laptops and clothes. The gang was smashed following a tip-off received by the Special Intelligence Bureau (SIB) that a member of the gang identified as Ogaga Pemu had arranged with someone to service his operational German pistol and also provide magazines for the weapon, The Nations reports. According to Pemu, who was arrested at Joe Baddy Hotel in Mende, Maryland, Yohanna who worked for JUMIA provided his gang information on the company in exchange for N200,000. Lagos State Police Commissioner, Fatai Owoseni who paraded the suspects said two locally made pistols, two cartridges, a locally-made magazine with two .9mm live ammunition and a laptop were recovered from the gang, adding that investigation was ongoing to arrest the absconded members.